Diabetu sergantiems asmenims, kuriems atliekamos juosmeninės stuuro dalies chirurginės operacijos, komplikacijų ir blogų išeičių rizika yra didesnė nei diabetu nesergančių asmenų, ypač jei glikemija blogai koreguojama. For patients with diabetes mellitus (DM) undergoing degenerative lumbar spine surgery, suboptimal glycemic control contributes to increased risk of complications and poor outcomes, according to a study published in the Sept. 15 issue of Spine. Javier Z. Guzman, from Icahn School of Medicine at Mount Sinai, New York City, and colleagues utilized data from the Nationwide Inpatient Sample from 2002 to 2011 to identify patients undergoing lumbar spine surgery for degenerative conditions. They examined the effect of glycemic control on perioperative morbidity and mortality. 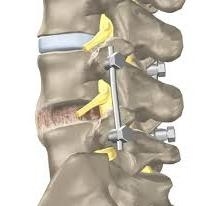 The researchers found that 403,629 patients with controlled diabetes and 19,421 with uncontrolled diabetes underwent degenerative lumbar spine surgery from 2002 to 2011. Patients with uncontrolled diabetes had significantly increased odds of cardiac complications, deep venous thrombosis, and postoperative shock, compared to patients without diabetes. Furthermore, patients with uncontrolled diabetes had an increased mean length of stay (approximately, 2.5 days), greater costs (1.3-fold), and an elevated inpatient mortality risk (odds ratio, 2.6; P < 0.0009). Compared to patients without diabetes, those with controlled diabetes had increased risk of acute complications and inpatient mortality, but not to the same extent as patients with uncontrolled diabetes. "Patients with uncontrolled DM, or poor glucose control, may benefit from improving glycemic control prior to surgery," conclude the authors.